Sales Vetting: Agree to Differ, or Differ to Agree? Dr. No must have been a veterinarian. Such, at least, was the implied verdict of many horsemen and women responding to a tweet posted by Gray Lyster of Ashview Farm the other day. One of Lyster’s many appealing qualities is that you are more likely to find him breaking powder at Jackson Hole than glazing his eyeballs on social media all day. On Saturday, however, he was prompted into one of his sporadic messages by the fact that the “two worst vetted yearlings” in Ashview’s past two crops had both won on debut last week. “When you are vetting horses to purchase, please keep that in the back of your mind,” he added. Yet those most incensed by each other’s perceived positions often turn out to have plenty in common. As so often, the difficulty comes when nuances of grey are stripped out for a black-and-white, right-and-wrong polemic; reduced, in this case, to the catch-all notion that a horse can “pass” or “fail” the vet according to some objective and immutable scientific standard. Even the most cursory consultation of vendors, buyers and veterinarians quickly shows that different people, with different priorities, are absolutely entitled to different perspectives on a highly subjective challenge. They’re all dealing with adolescent, changing animals, whose inevitable and hugely varied imperfections of flesh and bone place them somewhere on a spectrum of risk. As one who understands both sides of the deal, also being a pinhooker, Ingordo stresses that different standards must be applied to horses for different purposes. “Horses have problems that may or may not affect their racing ability,” he says. “But if you’re going to resell you must have a horse literally everybody can buy. When I’m doing that, I’m not trying to sell the horse to myself next year; I’m trying to sell to a pool of buyers that have money to spend and an opinion about how to spend it. And what I can accept and what they can accept are two different things. “There are tons of horses with issues that will be fine to race. But when you’re buying them, there’s an associated amount of risk. And it’s a dollar amount. I’m willing to lay out $30,000 for this risk, associated with this vetting report; or I’m willing to shell out $1 million on this one. So there’s a risk and reward in it. Equally he remembers his vet producing a research paper that surveyed 100 horses with the same problem they were contemplating in a yearling: a spur projecting from the back of the knee into a ligament. Not one of the 100 had made the track. Yet this horse, duly rejected by Ingordo and his team, changed hands for $475,000. So he plainly “passed” the vet, and big time, for someone else. Different things work for different people. Carrie Brogden of Machmer Hall, who applauded Lyster for igniting the debate, gives an example from the recent January Sale at Keeneland. She was underbidder on a $40,000 colt, who had been certified by a vet she recognised. Subsequently she received a call from the consignors explaining that the buyer, who had not had him vetted beforehand, was “freaking out” after his own vet subsequently diagnosed moderate sesamoiditis in the front ankles. But the Greathouses knew they could take Brogden at her word, and did so when she assured them that the young Bernstein filly’s hind ankles had never blown up. As the other side of the same coin, she recalls frankly turning Niall Brennan against a very handsome and well-bred horse, whose ankle problems had indeed reached a clinical level. Sure enough, that horse never got to the track—and she trusts that Brennan will remember her candour whenever she gives him the green light in future. If anything, Ingordo wonders whether there might be a chicken-and-egg element, in that prepping young stock is nowadays so intense. If a horse is forced through the commercial process too early, it may come up with marginal issues that simply require a little patience. And that’s where the guy signing the check comes in. Sometimes he will want a horse to be in Ocala on Oct. 1 to start the breaking process. Ingordo will sometimes plead on behalf of a nice horse: it only needs a P1 flake [first/proximal phalanx] taken out, say, the equivalent of a tonsil for us. But if his client doesn’t want to wait, he doesn’t want to wait. Lyster himself actually takes a similar view on that: unlike many consignors, he does not resent the vets themselves for failing horses, instead suspecting that they are given little margin by their patrons. Lyster accepts that in a crop of 20 there will typically be one that comes with blatantly high risk. But nowadays he feels that a major issue will be made of anything that is “remarkable,” rather than significant: anything, literally, you can “remark” on. And he reckons that maybe half those 20 horses will today be “crucified” for something of that ilk: something merely mentionable. “Do you know what you need to do?” replied Lyster. Of course, the ultimate corrective to the market is the racetrack. If people are letting good runners slip through the net, there is value there for the discerning shopper. “I understand how we have a limited amount of buyers, and how each year people are taking tons of risk in our industry,” Lyster says. “If you’re going out there to buy one or two yearlings, I understand why you’d want to be super picky. But it’s got out of control if horses with a couple of ‘remarkable’ findings, that rarely bother horses, become valueless. To be fair to the veterinarians, they too object when their own judgements on matters of degree are presented as absolutes. And, as both Ingordo and Lyster have acknowledged, often it is actually the vets’ clients who do that. 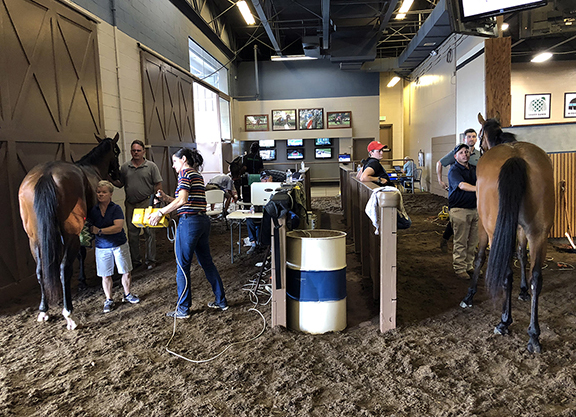 “We would very rarely use the terms ‘pass’ or ‘fail’ when we’re looking at horses,” stresses Dr. Scott Hay, president of Florida racetrack practice Teigland, Franklin and Brokken DVMs and vice-president of the American Association of Equine Practitioners. “Now, some clients don’t understand anything other than pass, fail; and sometimes they drag us into that terminology. But we really resist it. The most important part, typically, is to be working for people with whom we’ve developed a good relationship over time, and whose tolerances for certain findings we have come to understand. “Now over time we may change our level of tolerance for a certain finding, if we realize that maybe we missed a horse because we had a prejudice against a certain finding. The flipside is that sometimes we may prove too tolerant, and horses have a poorer racing career than expected because of something we were happy enough to accept. “We try not to get prejudiced about findings we think will probably be all right for a horse’s racing career. The issue is that some clients just don’t want to take a risk of any sort. I’m not trying to sit here and tell you it’s always the clients, if we miss a good horse. Sometimes the vet leads them down that path as well. But I do think we all take a bad rap for turning down a horse. But stories like that shouldn’t necessarily alter anyone’s position. If it’s all a question of degree, then those that do survive doubt and prosper as runners don’t—in themselves—prove that the original doubt was misplaced. As Ingordo said at the outset, the same issue can look radically different from one perspective to the next. And, as he also emphasises, nobody—on any side of this equation—is always right. “Vets vary in opinions but they all have the opportunity and the right to work,” he says. “So there are some who would turn down Secretariat at the head of the stretch in the Belmont and say he doesn’t vet; and there are others who’ll pretty much wave them through, no matter what. Buyers can be too stringent. Myself, I’m pretty forgiving. We have good clients and use horsemanship in every process. But the buyer’s the one putting up the money and if they want things a certain way, that’s their prerogative. Nobody’s perfect in this game. But the term ‘does not vet’ is very subjective and needs qualification. But that beauty of this business is that we don’t establish who’s wrong or right by arguing about it. We have that oval out there, with a wooden stick opposite the stand. And we can sort it all out there, every day of the week. 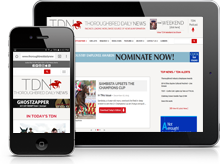 That said, you would be very welcome to carry on thrashing things out in the horseman’s forum that is TDN. If so, we’d love to hear your views. Email us at [email protected] if you have comments for publication.